On Sunday, September 2nd, 126 runners and walkers, 35 volunteers, and many spectators joined us in Bayfield to support Jesse, an 11-year-old boy from Middlesex County who has been battling cancer. Jesse is a Wish child with Make-A-Wish Southwestern Ontario (SWO), and his wish is to go to Costa Rica. We are thrilled to share that his wish was granted on the morning of September 2nd, thanks to Run4Kids 2018. Jesse and his family will be going to Costa Rica in November to fulfill his dreams of zip-lining, seeing monkeys and sloths, and visiting the country’s beautiful waterfalls and hot springs! The event kicked off with a few words from Jesse and his mother, Amy, who shared some moving words about their journey. We then jumped into a warm-up led by Nicole Rogers from the local YMCA, who got the crowd energized with her aerobics-style instruction. Even Spiderman participated in the warm-up! The runners took off at 9 a.m., and the first participant passed the finish line in a flash. The winner this year was Simon Meades of Holmesville who finished in 18:09, shaving nearly a minute off his finish time last year. As runners and walkers completed the course, they enjoyed refreshments provided by The Pink Flamingo Bakery, Shopbike Coffee Roasters, Bayfield Foodland, and Fairholme Dairy. Jackie Hivert of Make-A-Wish SWO spoke briefly about the organization and the impact of Run4Kids. As Jackie’s speech wrapped up, our announcer noticed a surprise participant jogging toward the finish line. Jesse turned to see a giant monkey carrying a gift bag—he was ecstatic! Jesse and his mother opened the bag, inside which was a stuffed monkey embroidered with the words “YOU’RE GOING TO COSTA RICA!” With that, Jesse’s Wish was granted! We were very fortunate and grateful to have the opportunity to organize Jesse’s Wish Reveal. It was truly an honour to be a part of it, and we can’t wait to hear all about his trip. We were astonished once again at the support of our community. We would like to extend a huge THANK YOU to everyone who supported the event by volunteering, donating, sponsoring, promoting, or simply sending their best wishes—thank you to all! We would like to specifically thank the following businesses, organizations, and individuals. And, of course, all of our volunteers, donors, and participants! Thank you to EVERYONE who made this possible! 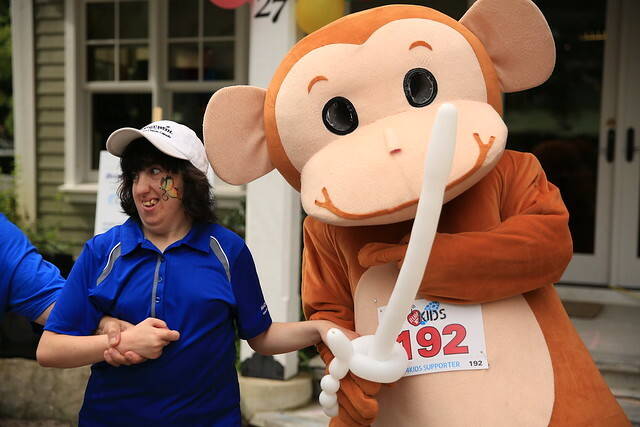 The Run4Kids is a huge community effort, and it wouldn’t be nearly as successful without our incredible supporters. We will provide an update on our fundraising results once we have tallied all of the donations. 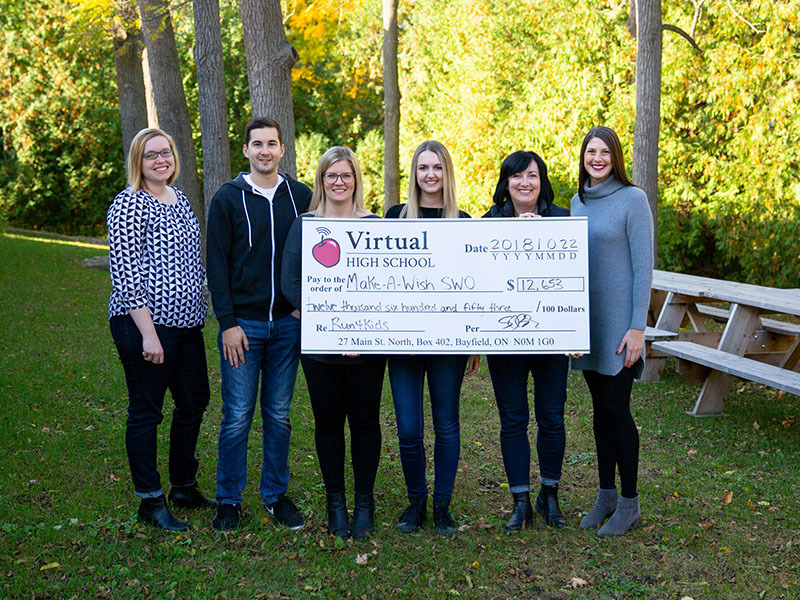 UPDATE (October 22, 2018): Lori Quick, CEO of Make-A-Wish SWO, visited us in Bayfield for the final cheque presentation on October 22, 2018. The total raised from the Run4Kids 2018 event was $12,653. Thank you to the Bayfield Optimist Club, our sponsors, the community, our staff, participants, volunteers, donors, and all of our other supporters. We are excited to hear about Jesse’s Wish Trip! Left to right: Amanda Zehr (VHS), Denis Lalonde (VHS), Jackie Loebach (VHS), Samantha Gowanlock (VHS), Lori Quick (Make-A-Wish SWO), and Kaylin Smith (VHS).